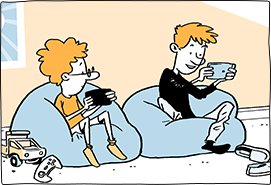 This cartoon was partly inspired by a small irreverent San Francisco clothing company called Betabrand. They compete against far larger fashion companies and can’t win on traditional media spending, so they are forced to do things differently. On Thanksgiving last year, Betabrand created the very funny Gluttony Pants, launched to “honor the rich American tradition of overindulgence.” It includes three buttons for waistline expansion during the Thanksgiving meal and comes with its own napkin. 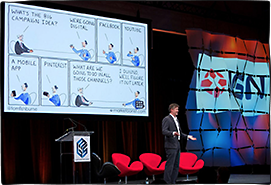 Betabrand didn’t have a traditional marketing budget, but the Gluttony Pants inspired Conan O’Brien to talk about them in his monologue that week. From the success of the Gluttony Pants, Betabrand ultimately launched pants for the other seven deadly sins: Envy, Wrath, Lust, Sloth, Greed, and Vanity. My favorite is Envy, where they created one and only one pair and sold it by auction so that the rest of us have to envy the winning bidder. It’s this type of marketing that people talk about (and helped propel Betabrand from a bootstrapped startup making horizontal “Cordarounds” to a clothing brand with a couple million dollars in sales). Founder Chris Lindland describes their business as “99% fiction and 1% fashion”. They launch a new product every single week, each telling a story worth sharing and requiring no traditional media. Betabrand thrives by exploiting the Achilles heels (and deadly sins) of brands with greater resources and marketing budgets. When you’re a little brand, you can’t afford to do whatever you did last year or whatever your competitor is doing. However, there’s nothing stopping larger established brands from being equally creative and looking beyond the deadly sins of marketing. You can think like David, even within Goliath. 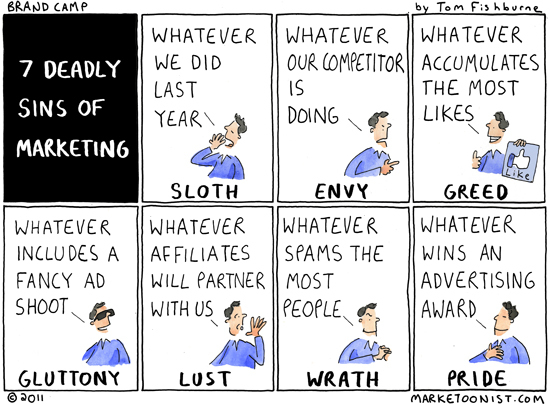 I’d love to hear your thoughts on the deadliest sins of marketing. 1. Not applying the principles of direct response marketing as outlined in “Scientific Advertising” by Claude Hopkins. 2. Failing to build a customer list and a list of prospective customers. No list, no business. 3. Neglecting existing customers and failing to communicate with them often enough. 4. Not having a clear USP or at least a clear answer to the question “Why should anyone do business with you”? 5. Failing the “What’s In It For Them”? test in any communication. Closely linked, failing the “So what?” test. 7. Bragging! Bit of a fine line here. If you win awards that add to your authority and credibility, then it’s OK to mention that where appropriate. Awards can also be newsworthy and a reason for a promotion. What’s not good is endlessly going on about awards that you might be excited about but the customer doesn’t really care about. Of course, the absolutely biggest marketing mistake is not appreciating your copywriter and failing to pay them oodles of cash! Love it! Betabrand’s situation reminds me that Polaroid, when it was starting out, could not afford to pay for magazine ads up front. TV was willing to extend them a little credit. And that made all the difference in the world. Sometimes when you are forced to do the unexpected it turns out to be the best thing you could possibly have done. No sin in that! The deadliest sin that seems to connect them all. That’s why brands like beta resonate. they haven’t the time, money or resources too. Here in the UK, its brands that break rules, expose sinners and do the basics brilliantly that win hearts and minds. 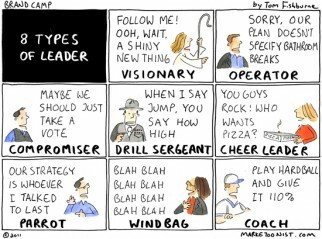 Tom – love this one, we’ve all been in too many uninspired meetings where the Marketing lead pulls out your ‘7DSOM’ handbook and uses it. I think you should do another version of this just for the fancy Ad shoot – (1) just love hanging with Ad people, (2)get to travel to exotic locations (3) shoot in New Zealand when Lincoln Nebraska would have worked, (4) use a celebrity to jazz up an underwhelming idea, (5) win award at Cannes for an ad with .45 ROI, (6) create a really funny ad that nobody can determine what brand it is for, etc. *Pride/Envy: Focus too much on what other brands are doing and wanting to reapply what competitors do, even if not a good fit for the brand. *Wrath: Allowing the brand to enter into self-destructive conflicts with customers or competitors on price, claims, etc. *Diligence: Keeping the brand’s finger on the pulse of the market, and working to respond properly to it. *Patience: Staying the course of what the brand’s strategy is when you know it is the right course, rather than over-reacting to others’ activities. There are virtues that can come from the creative mind working within incredible constraints. Like the astronauts and engineers of Apollo 13 rushing to create systems only from items on the spacecraft, working with limited resources can bring out the best in us. I’ve occasionally challenged people to create a campaign with a budget of $100, just as a creative exercise, and to challenge formulaic responses to marketing challenges. Sometimes a lack of options liberates our thinking. No money and no time do not always lead to clever outcomes, but they do awaken the survival instinct, don’t they? 1. Letting the ad agency determine brand strategy, usually surreptitiously. 2. Thinking that you own the brand, not the consumer. 3. Cognitive dissonance – finding data to justify your prejudices. 5. Launching NPD without a clear equity benefit for the brand; even worse, riding on the back of the brand and having merely a tenuous fit. 6. Being driven by the process not the substance. 7. And the worst – knowing I’m on the brand for x years and doing what the hell it takes to make an “impression” and to hell with the future after that. 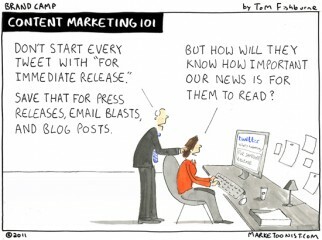 Tom, this cartoon is so true! It is people who don’t study direct response marketing or even pick up ANY book on marketing. Like years old, people advertising in the Yellow Pages (remeber them) and letting the sales person layout the ad for them. Dumb, dumber, dummest thing to do! WOW, THIS IS ONE HELL OF AN ARTICLE! Ok, the jig is up, I’m the founder of Betabrand and I love seeing my name and creations posted anywhere. 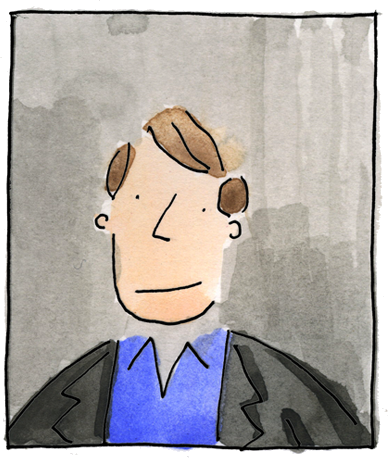 In honor of the wise Fishburne, I’ll reveal the 7 sins of marketing according to Betabrand. Gluttony: Going back to the same promotion over and over and over again. Envy: Trying to beat better-funded companies at their own game. Greed: Making only the products that make the most money at the expense of customer experience. Vanity: Thinking that journalists should write about whatever you’re selling regardless of how good of a story it actually is. Wrath: Making your competitors grovel before you and beg for forgiveness before smashing them with your war hammer. Awesome creativity and insights this week. Love your recommended deadly sins additions. This week’s cartoon goes to Kris. Great addition of the seven cardinal virtues of brands. Also very cool that Chris from Betabrand stopped by to share his 7 deadly sins. I particularly like Wrath, “Making your competitors grovel before you and beg for forgiveness before smashing them with your war hammer”.